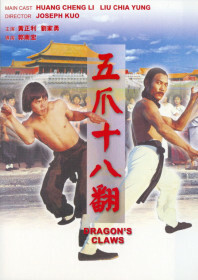 This cheap indie from Joseph Kuo has Hwang Jang-lee in top form as a Dragon’s Claw expert in search of an inscribed talisman which declares him the world’s best fighter. For some reason, Hwang and his cronies kill off Lau Ga-yung’s kung fu schoolmates, causing him and his mother to run for their lives. Lau (who looks like a cross between a young Jet Li and Donny Osmond) learns the Dragon’s Claw style from his mother (Yuen Qiu) and a dodgy old medicine man who ties him up, hits him with a big caber, and forces him to drink urine. (Clearly a case for social services). When both parents are slain, Lau troubles Hwang for a duel, and an extended brawl ensues. It’s another spin on the Snake in the Eagle’s Shadow formula, but the familiar cast make it presentable, matched by a few innovative moments of great choreography and some hilarious dubbing. “Old man, I came here to learn your strange blow.” Stuff like that. AKA: Dragon Claws; Dragon’s Claw.